Good afternoon, I'm trying something a bit different for me for our September theme month. Our theme is 'ocean' and I'm looking to do some collaborations with fellow bloggers and parents. I'll still be posting my usual 4 activities and 4 meal ideas but I'm wanting to extend the themed posts offered by including other bloggers ideas. I'm hoping that there might be a few of you out there who might like to write a guest post, allow me to link to a existing post you have in your archives, provide links to your ocean themed pinterest boards or recommend any books, toys or films that we could add to our supporting posts. You don't have to be a blogger, if you have a great idea and are able to write a post in word (or similar) with photo's I'll be happy to turn that into a blog post and link back to any social media you use. The sort of posts I'm looking for are toddler/child/family activities, food and meals, book/film/venue reviews. If there is enough interest I'd also love to provide a weekly linky, so please spread the word so together we can make this happen. In return a link back, tweet or mention to the post you are featured in would be appreciated. A huge thank you to Aparna at The weaving ideas who provided the inspiration for this idea and who has kindly allowed me to link to one of her posts, so look out for that next week. 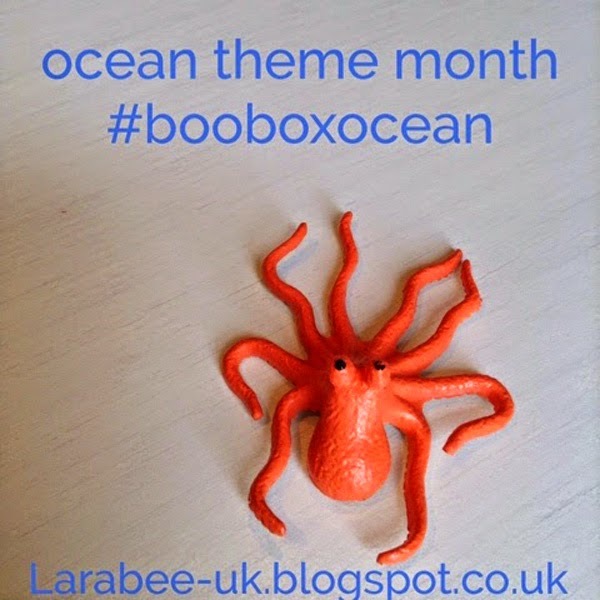 Our ocean theme activities, posts and ideas will be tagged with #booboxocean and you can follow our ocean pinterest board here if you'd like to be able to pin your own items to this board drop me a message on pinterest so I can follow you and add you to the pinners group. Just as a heads-up our October theme will be 'around the world' so I'll also be looking for bloggers and parents from different countries and cultures, to help me provide a varied and diverse range of activities and food from around the world. Contact me in the same way if you'd like to join in. Thanks so much for taking the time to read this post and I really hope that we can get a little bit of interest to try and start building a little community. We did some Ocean themed stuff in June and the kids loved it. Feel free to link to any posts.